A new photo captures the intricacies of the Orion Molecular Cloud Complex, the closest massive star forming region to Earth. A telescope in South America has captured a spectacular new view of an intricate cloud of interstellar dust in the famed Orion constellation. The new space cloud photo, taken by the Atacama Pathfinder Experiment (APEX) telescope in Chile, reveals what astronomers call the Orion Molecular Cloud Complex in unprecedented detail. It gives scientists a glimpse into the heart of the closest, most active region of massive star formation to our solar system, researchers said. The molecular cloud is located about 1,500 light-years from Earth in the Orion constellation. The new APEX image includes a reflection nebula called NGC 1999, which is only part of the vast molecular cloud. The cloud is actually a separate entity from the more well-known Orion nebula, which is located nearby. Reflection nebulas get their name because their dark dust clouds reflect the light of nearby stars. 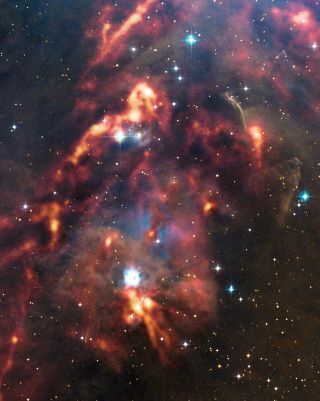 For NGC 1999, the light stems from the young star V380 Orionis, ESO officials said in an image desciption. "Normally, a dark patch such as this would indicate a dense cloud of cosmic dust, obscuring the stars and nebula behind it," officials with the European Southern Observatory, which oversees the APEX said in a statement. "However, in this image we can see that the patch remains strikingly dark, even when the APEX observations are included." Scientists suspect that the dark spot was created when a star sucked up all the material in that part of its stellar nursery, leaving an empty spot in its place. The extremely sensitive telescope captured the photo by measuring long wavelengths of light that aren't on the visible spectrum. Most telescopes aren't able to observe light at these submillimeter wavelengths, and would only see dust and clouds obscuring the star formation in the background. At 40 feet (12 meters) in diameter, APEX is the largest single dish telescope operating at these hard to detect wavelengths in the Southern Hemisphere. It is a prototype designed to test technology needed for a next-generation submillimeter telescope called the Atacama Large Millimeter/submillimeter Array, or ALMA. The $1.3 billion ALMA observatory will ultimately be a network of 66 telescopes spread across 11 miles (18 kilometers) in Chile. ALMA has already completed its test cycle of experimentation, and will officially open in March.